Brooke was born to a northern Irish military family and was raised abroad, reputedly speaking French and German before English. His father died when he was just eight years old. Joining the British Army as an artillery officer in 1902, Brooke served with great distinction in the First World War, commanding Canadian and Indian troops, and he has been credited with creating the creeping barrage. He was repeatedly an instructor at the Staff College and the Imperial Defense College. He was director of military training at the War Office in 1936-1937. 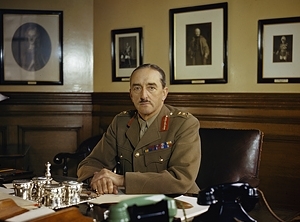 The outbreak of the European war found him in command of Antiaircraft Command and Southern Command. In the battle of France, he commanded II Corps, where his doubts about the wisdom of the Allied advance into the Low Countries was mistaken by some fellow officers for defeatism. However, during the retreat to Dunkirk, he managed to close the 20-mile (30 km) gap created by the sudden surrender of the Belgians and thereby very probably saved the British Expeditionary Force. Named as commander of a second expeditionary force, Brooke decided soon after landing at Cherbourg that France had lost all will to fight and turned his attention to getting his troops back to England. While this was a realistic attitude given the situation, it later fed a belief among some senior American planners that Brooke opposed an assault on France in 1942 or 1943 because he lacked the confidence to meet the Germans head on in battle. It is probably true that Brooke was overly cautious about invading northwest Europe; it is equally true that his American counterpart, George C. Marshall and the Americans were not sufficiently cautious, and the compromise date of spring 1944 turned out to be the optimum time for invasion. Brooke was named commander of Home Forces at the height of the invasion threat and was still serving in this position when war broke out in the Pacific. Shortly thereafter he was appointed chief of the Imperial General Staff, the highest post in the British Army, replacing John Dill, who became the British liaison in Washington. Most historians agree that the quality of British generalship improved markedly thereafter. He was arrogant and condescending towards the Americans, with the surprising exception of MacArthur, but then he was arrogant and condescending to most British officers as well. His most common assessment of a senior commander of any nationality was that he lacked "strategic vision," a charge made so universally in his diary that it became a formula. However, Brooke's strong personality allowed him to stand up to Churchill and quash Churchill's more unrealistic operational concepts, such as invasions of northern Norway or Sumatra. Murray (in Murray and Millett 1996) takes a much dimmer view of Brooke, assigning him the blame for the British inability to rapidly adapt to the modern battlefield in the final years of the war. In particular, he points out that Brooke saw to it that not a single one of the British innovators in armored warfare achieved command of an armored division in combat. After the war, Brooke was created Field Marshal Viscount Alanbrooke. Behind his cold and tough facade, Brooke was an emotional man. His wife had died in a car wreck in 1925, and Brooke wrote two years later that "I very much wish I could have finished myself off at the same time." He was an avid hunter, fisher, and bird watcher, the latter an interest he shared with Marshall.